Create a business & a life you'll love with us! We love to share ideas with you because we know how Young Living products offer so much more for every area of your life and health care - PLUS how to live an eco-friendly, eco-green - real-green life. You'll like supporting sustainable, bio-diversity farming - and in helping to preserve & protect Mother Earth! And we also feel passionate to help you with your financial care too , the BIZ side of things. You'll love all the Benefits of 'lighting the way' for yourself and others by being a DeVita 'Diamond'. So, how exactly do you acquire your own Free account as a Canadian and become a member too? There are two pathways to membership—you can become a Wholesale Member or a Retail Member. First you must have a sponsor ID number ( from one of the Diamond member's page) in order to register and become a member. If you do not have a sponsor ID # - then, by all means, please use Dr. DeVita's number 16072 as your sponsor. Directions in how you can enroll below with easy to follow steps.....filling in as your sponsor, Dr. DeVita's ID # 16072. The very first step to becoming a wholesale member is to register on-line or phone in to get your membership. Great news- It's free for us Canadians and many international countries so it leaves room to order the products that you really like to have. In the U.S. you start off by buying a starter kit. There are a few different starter kits you can buy, but we wholeheartedly recommend the amazing Premium Starter Kit, which is the BEST deal and has everything you need to get started on your essential oils journey! If you’re just not ready to jump into wholesale membership, then simply buy the products online at full retail value. You can easily register online to have your own account for purchasing Young Living Essential Oils. A huge 24% off retail prices on any Young Living product. Simply visit our Diamond Leadership page, choose one of the leaders and visit their website's how to become a member page. From there, you will be redirected to the Young Living signup page. Choose a membership type and enter the information of the Diamond leader you have to chosen. 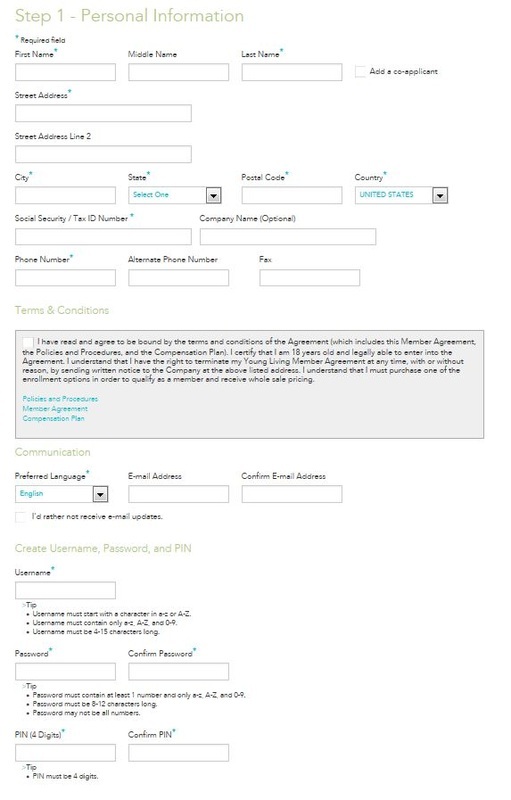 Enter your personal information, create a username, choose a password and select a 4-digit pin number. Remember to choose a strong password and write down all the info. somewhere so you won't forget! Choose the Premium Starter Kit. Its the only one that comes with essential oils- you receive 11 oils, a diffuser and samples! Sold separately these kits can cost up to $250. 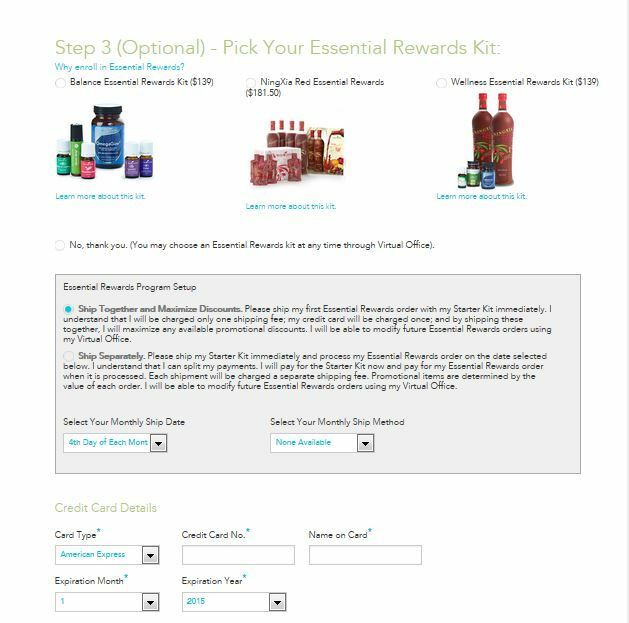 Whether you choose an essential rewards kit, is up to you. If you prefer not to, you can go with the "no thank you" option. After that, select a shipping method and fill in the billing information. The next page will allow you to confirm your purchases one last time and ﻿that's it﻿! You will officially be a member after that and your membership will stay active as long as you spend at least $50 every year. This means, you will never have to actually "renew" your membership. You can relax and enjoy that amazing kit you'll receive. You will LOVE it!